Today, Columbia University and data-analytics firm Jupiter are announcing plans to collaborate on improved hurricane track simulations, so that the public and private sectors can plan for weather and climate risks. Columbia’s ground-breaking hurricane and climate science will be added to Jupiter’s ClimateScore Intelligence Platform, which translates research into information that decision-makers can use to manage and mitigate climate change risks. The platform already predicts local probabilities of extreme temperatures and flooding; soon it will include hurricane-related hazards such as heavy winds, rain, and storm surge. 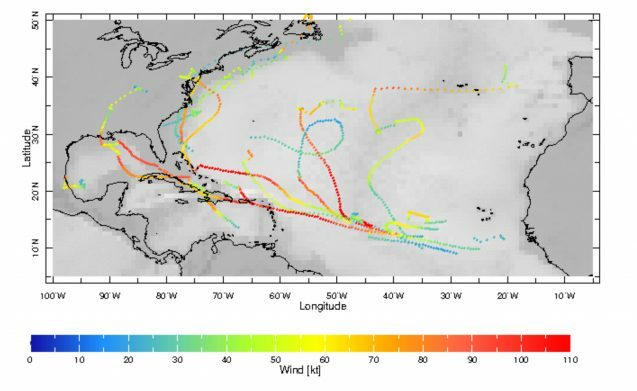 As part of the collaboration, Columbia’s Yochanan Kushnir, Upmanu Lall, Jennifer Nakamura, and Naomi Henderson will lead efforts to expand upon their Hurricane Interactive Track Simulator (HITS). Kushnir is a research professor specializing in climatology at Lamont-Doherty; Lall, a Columbia Engineering professor who heads the Columbia Water Center, is an expert in hydroclimatology and in weather and climate risk analysis; Nakamura is a climate analyst at Lamont-Doherty; Henderson, also from Lamont-Doherty, will be providing system management assistance. Currently, the HITS model simulates hurricane tracks and assesses landfall risk along the Atlantic coast of Central and North America. The team will extend the model to include the effects of severe wind and precipitation, which can be used to assess the risk of coastal and inland flooding. This is a critical step toward designing risk management strategies. Jupiter is committing more than $300,000 to the upgrade, and will provide technical support.